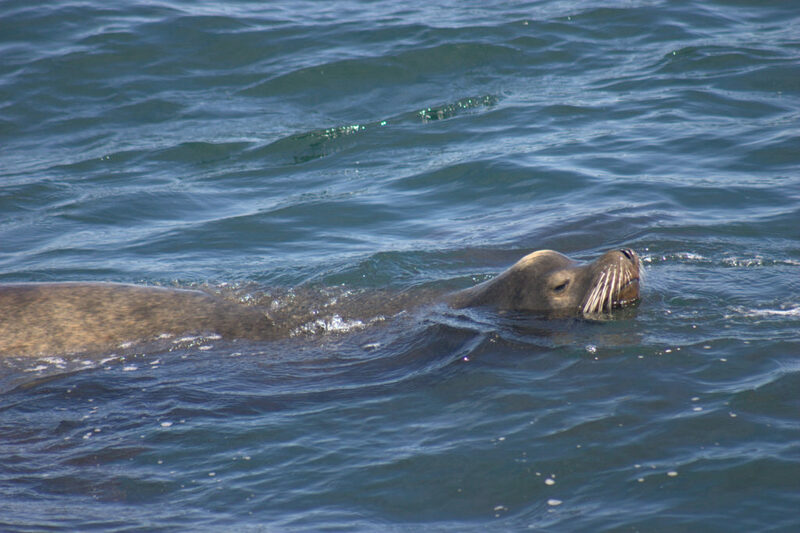 Pinniped refers to the group of marine mammals that have front and rear flippers and includes seals and sea lions. These animals live in the ocean but are able to come on land for long periods of time. Earless seals (or true seals) can easily be identified by looking at their ears and flippers. They have ear holes but no external ear flaps. They also have small front flippers and move on land by flopping along on their bellies. At sea, true seals move their rear flippers back and forth like a fish’s tail to propel themselves through the water. 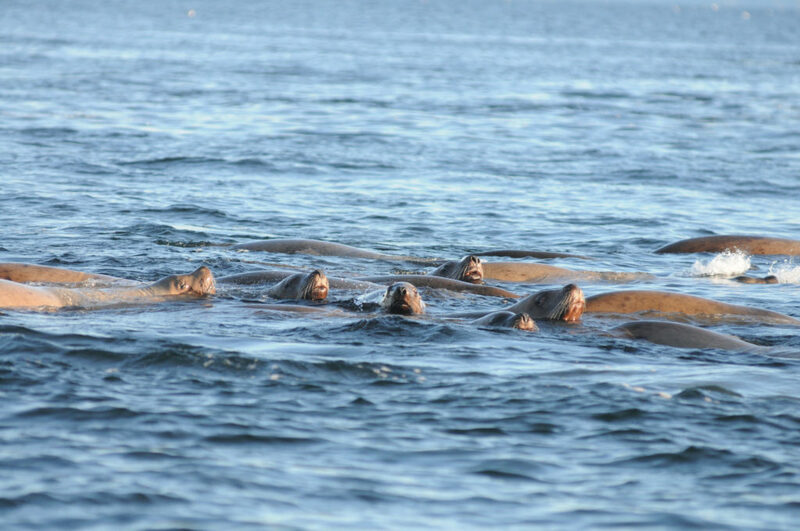 Another family of pinnipeds which includes sea lions are referred to as eared seals. Unlike true seals, they have external ear flaps. Their front flippers are large, and on land they are able to bring all four flippers underneath their bodies and walk on them. In the water, they swim using their front flippers like oars. California Sea Lions can often be seen hauling out on the shore, buoys or docks. They have broad fore flippers, a narrow snout and external ears. Often when hauled out they defend their territories with aggressive physical displays and vocalizations which sound like dog barks and growls. 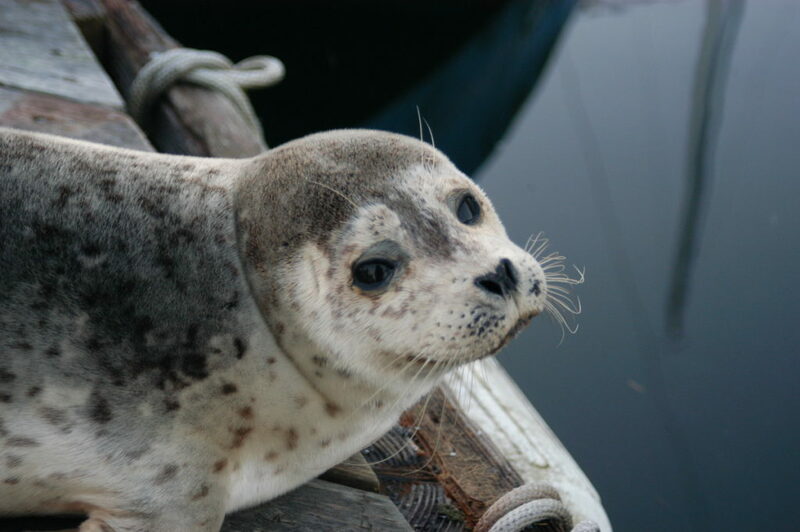 Harbor seals are the most common marine mammal in the Pacific Northwest. Curious harbor seals sometimes rest vertically in the water while watching beachgoers. 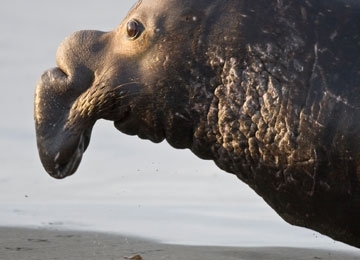 Northern elephant seals are the largest of the “true”, or “earless”, seals in all of the Northern Hemisphere. The have a large range in the Pacific Ocean and can be seen from Alaska to Mexico. Steller sea lions, also known as Northern sea lions, are the largest of the eared seals, sometimes reaching ten feet in length and 2,500 pounds. They are light brown to blond with dark flippers.